Billy is sad because his friend doesn’t want to play with him. Susan is angry because she doesn’t want to pick up her toys. Tammie hates her baby brother and wants to hit him. No wonder many adults have trouble expressing their feelings. As children they were not allowed to feel what they felt. Next time you feel like fixing, squelching, or denying feelings, try to just validate them—through a question or a statement. “How are you feeling about that?” “I can see that makes you very mad.” “Little brothers can be so annoying.” Sometimes it can be encouraging to validate feelings, with your lips together, "Mmmmm." (Of course that “Mmmmm,” should convey empathy.) 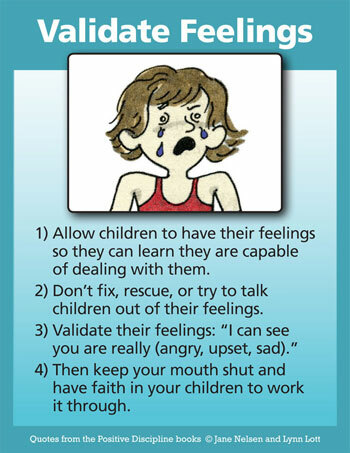 This allows children to discover that they can work through their feelings and learn from them. Avoid over-validating. I have seen some parents validate, and validate, and validate. It is as though they think that lots of validation will “fix it”—help their children feel better. One of the hardest things a parent can do is watch their children suffer, but it is important to allow your children to feel what they feel so they can learn how capable they are when they work it through. Feelings give us valuable information about who we are and what is important to us. 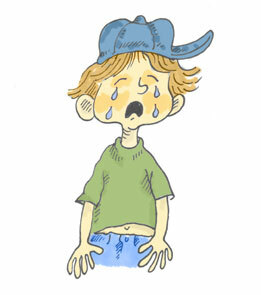 Children need to learn that it is okay to feel whatever they feel. We can then teach them that what they DO is a different matter. Feeling angry doesn't mean it is okay to avoid chores or hit someone. Feeling sad isn’t a permanent condition, but is an important life experience. How can children learn to understand the difference between feelings and actions when we discount their feelings? Once children have their feelings validated, and have an opportunity to calm down, they are usually open to appropriate actions. Tammie’s mom could say, “I can see that you are very upset with your baby brother right now. I can’t let you hit him, but you can draw a picture about how you feel. We help children understand the difference between feelings and actions when we start early to teach children that feelings are okay. When your child says, "I'm hungry." Don't say, "No you aren't. You just ate twenty minutes ago." Say, "I'm sorry you are hungry. I just cleaned up from lunch and I'm not willing to fix any more food right now. You can either wait until dinner or you can choose something from the healthy snack shelf." This is respectful of the child's feelings and needs and your own. Children learn resiliency when they have the experience of working through their feelings and learning that they pass—eventually. Many times they can work through their feelings on their own. Other times you can involve them in problem-solving—after everyone has calmed down. We help children understand their feelings and deal with them effectively by taking them seriously and then helping them work it out or trusting them to work things out after they feel validated and have a little time. And, it is amazing how often children do work out solutions to their problems when they are simply allowed to do so in a friendly atmosphere of support and validation. Tal Ben-Shahar names that "the permission to be human": the active acceptance of our emotions... and it true for kids and grownup!!! I appreciate this from a very interesting perspective: I suffer from Borderline Personality Disorder. It is difficult to be an adult and still be unable to accept your emotions and it can be very difficult to overcome the obstacles it presents. Kudos to these words of wisdom!